site news | English, ESL -- and more! These posts are really popular! Thursday, October 16, 2008 was the busiest day ever, with 1,497 views, while the total for the blog stands at 239,898 since December 2006 with 55,524 so far this year – a daily average this year of 349 (last year it was 324). At the moment there are 220 posts. Sitemeter measures differently and has been monitoring since November 2002, thus including my earlier addresses. It tells me that there have been since 2002 206,154 visitors reading 300,816 pages. 6,070 views so far this month. According to WordPress, the total page views here will reach 200,000 today or tomorrow. That’s since December 2006. There were 500+ yesterday. Including pre-WordPress (that is Tripod etc) Sitemeter says we’ve had 260,009 page views since 2002 from 177,474 visitors. My own visits are not counted. The 200,000th page view happened at 7.15 this morning. The visitor came from Normandy in France. 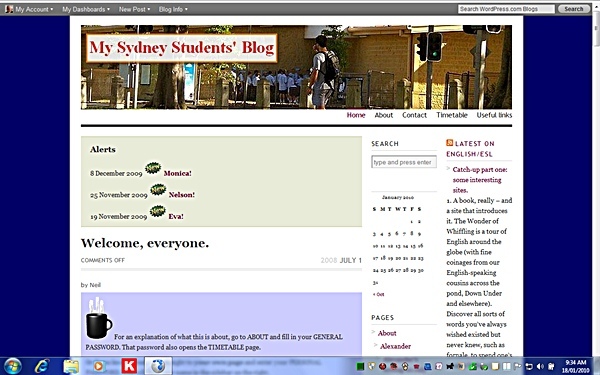 From January 2009 no fewer new posts will be added to this blog. Some posts and pages will be updated from time to time. There is a very strong possibility that new pages relevant to existing pages or to the 2009-2012 HSC in NSW may be added, and in that event there will be an announcement here. See also the Pages Guide in the side bar. Some posts and pages may gradually fall out of date as links and references will only be updated in a limited number of posts or pages. Thanks to all who have supported this site and its earlier incarnations on Tripod and Angelfire since 2002. I should point out again I am not closing down.